Since its inception as a strategy-based, multiplayer board game 15 years ago, The Settlers of Catan has grown enormously in popularity, meriting expansion packs and crossing over to digital as a computer game. Now, USM has released it for the iPhone as Catan: The First Island. Long-time players of the game will recognize it as The Settlers of Catan in its most basic form, with most of the original rules. Up to four players taking turns building settlements and roads along the borders of a 19-tile hexagonal playing field; each tile represents a different resource (wood, grain, sheep, brick, and ore) and has a number. 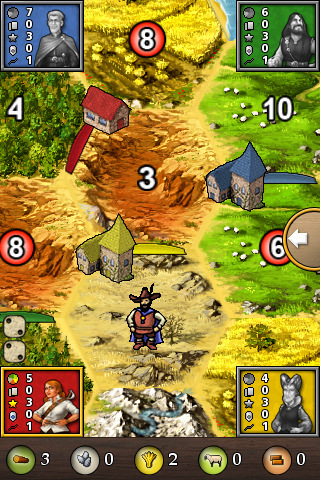 The beginning of each player’s turn starts with a roll of two die, and those with settlements bordering the tiles that match the number thrown benefit by collecting the resource on that tile. Using the resources collected, one can build more settlements, cities, and roads to expand; if you are lacking certain resources you can trade with the other players or with the Bank at a 4:1 ratio. The goal is to reach a predetermined amount of Victory Points (8-12) first and become the Lord of Catan. In addition, there are other tools one can use to win, such as 5 different Development Cards (found in the menu that rolls out when the arrow on the right is tapped and purchased with resources) and the Robber (who is moved to steal whenever someone rolls a 7). You can either play against the AI, or against your friends in a hot-seat multiplayer mode, meaning the iPhone gets passed around amongst the players. Why the developers chose not to utilize the online multiplayer abilities of wi-fi (or even Bluetooth) is beyond me; perhaps the next update will fix this. Another limitation is the lack of complexities that expansion packs for other forms of Catan bring; this version is, again, only the basics with a few options to adjust. One of those options is the turbo mode, which helps in speeding up the gameplay, but even with this mode playing Catan is needlessly laborious. Another complaint that seems to be common is that the AI is unfair–I’ve noticed that trades from the player’s end are exceedingly hard to get accepted. The concepts of Catan aren’t hard to grasp at all–rather, it is the strategies one has to create and employ to win that are complex. Each new game has a different set-up, and different opponents, so the strategies are never the same. First-time users will definitely benefit from a thorough glance at the comprehensive tutorials, but they are kind of an overwhelmingly huge information dump; it’d be much easier to learn the intricacies of the game through an in-game tutorial. However, Catan is visually very appealing (pinch-zoom to view the grid on a closer level) with nice animations and lots of fine details; the Renaissance-esque music and resource sound effects are also great (personally, I’ll never tire of the rolling die sound). It is a decent homage to the original board game, and for that it might be worth the $4.99 spent to find out what everybody’s so crazy about, despite the shortcomings of the iPhone app version. AppSafari review of Catan was written by Julie Guan on March 5th, 2010 and categorized under App Store, Featured, Fun, Games. Page viewed 4614 times, 1 so far today. Need help on using these apps? Please read the Help Page. A word of caution. This game does not have a random dice throw, but will increase the games difficulty as you get ahead of the other players by no longer throwing numbers you have. The other players target you extensively sometimes being attacked 7-8 times consecutively, even when you no longer have anything to steal. If you enjoy a challenge, go for it…if you hate frustration it would be better to avoid this game.